Film Club is back! The club is open to Year 6 pupils and meets every other week on a Monday. You can find out more information below. Selected films generally run for up to 100 minutes or so and usually timed to finish at or close to 5:15pm. Collection after the club is from the main office entrance. Pupils MUST have signed permission to attend this club. Forms will be handed out to those in Year 6 who are interested. Monday 23rd November - Our chosen film is The Jungle Book, which has a U rating and runs for 80 minutes. The last animated Disney movie to bear Walt's personal touch, this much-loved, exuberant adventure follows Mowgli, a young boy raised by wolves, as he journeys to seek safety with other humans in their village outside the jungle. Along the way he meets a number of memorable animals, including Baloo the loveable but lazy bear, and orangutan Louie, the "King of the Swingers' - but can he stay out of the clutches of sly tiger Shere Khan? 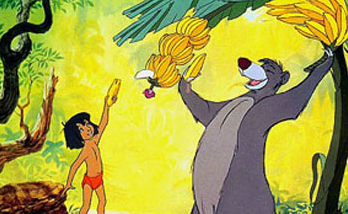 The Jungle Book is a children's classic, filled to bursting with great tunes, memorable set pieces, drama and hilarity. I will release pupils for collection at 5:00pm from the main entrance. As this club goes on beyond 4:30 it is advisable that pupils bring a snack with them. Whenever possible, I will provide water and squash during the performance and on occasions we will have a treat of popcorn. I will release pupils for collection between 5:10 and 5:50pm for most of our films. Some films may be up to two hours in length but pupils will be advised of such a change. Pupils will be released from the main entrance.